Kiwi Denny Hulme in the Chevrolet powered Mclaren M20. Bruce McLaren and Hulme won the championship twice each before Porsche 917 became dominant. In all McLaren won the Can-Am championship six times. At Riverside Hulme qualified in second place to put him on the front row but after the engine suffered a broken cam follower towards the end of the race he pitted to finish in 19th place. The wing and the wide body of the car provided massive downforce but even that could barely keep the huge power of the 8 liter engine under control. Hulme's teammate Peter Revson finished in second place. Burnin’ Rubber • by Mike Blanchard | Don Brown was a big fan of cars. He was also one of the more successful lobbyists in Sacramento. He was known around the halls of the Capitol as the Big O and he was a good guy. Brown recently passed away and left behind a lifetime worth of photos and posters and memorabilia related to cars and car racing. He also left some cars but that is another story. The Alfa Romeo Tipo 33/4 spider entered by Otto Zipper. Driven by American Scooter Patrick, the car which featured a much smaller engine (4.0 liter) than most of the other competitors, finished a very credible 9th place 5 laps down. Zipper was a well known Ferrari and Alfa dealer and racer whose showroom was on Wilshire and 26th in Santa Monica. Tipo 33s routinely punched above their weight thanks to being an extremely well balanced car. Primarily engineered by Carlo Chiti, they won the World Championship of Makes in 1973 and the World Sports Car Championship in 1977. The Tipo 33/4 was specially developed version to race in CanAm. Brown liked all kinds of racing, he left behind photos of stock cars, sports cars, Formula-One, Formula 5000, Can-Am, sprint cars, motorcycle flat track racing. And he was a solid photographer to boot. I have no idea what kind camera he used but the slides are Kodak Ektachrome. These slides were rescued from the garbage can as his family cleaned out his house. We will be dropping groups of Brown's photos, each of a different type of racing, over the next few weeks as a tribute to the Big O, a race fan and photographer. Ferrari 512 driven by Brit Mike Parkes. Entered by Modena Sports Cars, the 512 featured a 5 liter flat 12 cylinder engine. The 512 was a staple at Le Mans and international sports car racing but it was outmuscled by the Mclarens, Lolas and Porsches in Can-Am. Parkes finished around 10th place but the car was dis-qualified because it was taken out on the track by an un-licensed pilot, reportedly the owner of Modena Sports Cars. This group of slides are from the Riverside round in 1972. Can-Am was arguably the baddest most wide open racing series of the twentieth century and it produced cars that are still considered the rawest, fastest cars ever made. Missiles like the Porsche 917, the McLaren M8 and M20, the Lola T70, Chaparral and Shadow thrilled fans and scared the crap out of drivers. Can-Am or more correctly, the Canadian-American Challenge, ran from 1966 to 1974 and Riverside, out east of Los Angeles, was a staple of the series. The baddest dog on the block. Mark Donohue driving Roger Penske's smashing 917/10 turbo. These cars could be tuned to make well over 1000 horsepower. Donohue finished in third place behind Peter Revson in the Mclaren on this day. His teammate George Fulmer won the race and went on to take the championship in ’72. 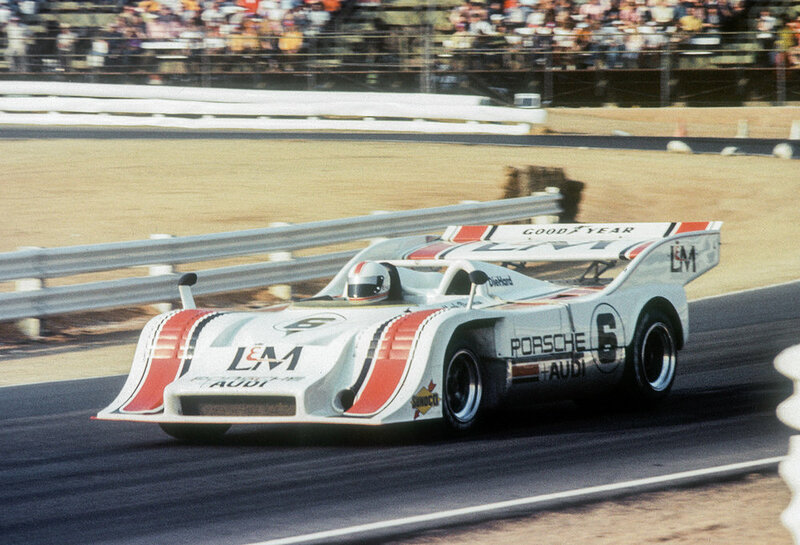 The next year Donohue would take the championship in the even more powerful 917/30. These are among the most desired and feared of all vintage sports cars. The best drivers of today approach them with caution and a light touch. The series featured two races in Canada and four in America, thus the name. It was for unlimited engine sizes and was pretty much a run-what-you-brung free for all. It was finally killed by Porsche’s incredible 917-30. The things made somewhere in the neighborhood of 1500 horsepower and with George Fulmer and Mark Donohue driving they were all but unbeatable. Add that to the reality of the times, the oil crisis, mounting pressure for safety and insane cost. By 1975 it was game over. The unique, Chevrolet-powered Shadow Mk lll driven by Bobby Allison. The Universal Oil Products sponsored car placed fourth on the day despite DNFing on the last lap with a broken input shaft. Teammate Jackie Oliver in the number 101 Shadow broke a piston before the race and did not start. 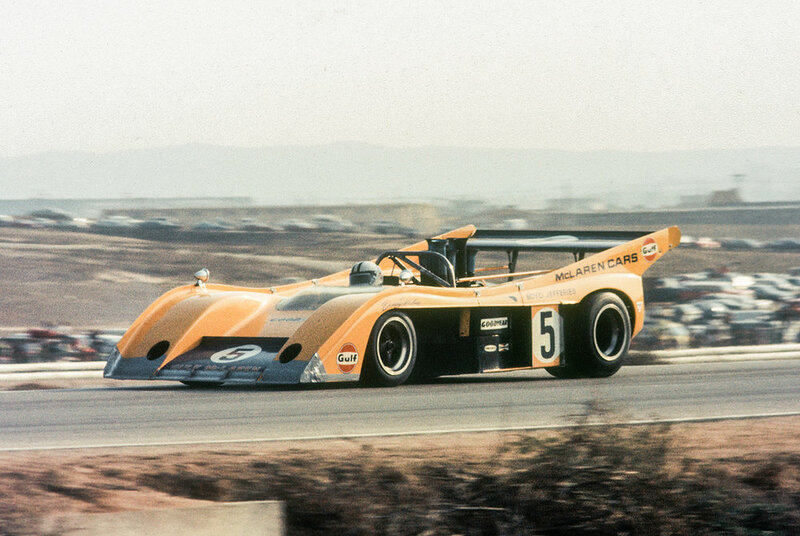 In 1974 Oliver won the last Can Am championship in the turbocharged 8 liter Shadow before the team moved on to Formula One and Can Am collapsed. Shadow team principle Don Nichols was a colorful and somewhat mysterious figure who was one of the last successful American F1 privateers. They cars were designed by Brit Peter Bryant.